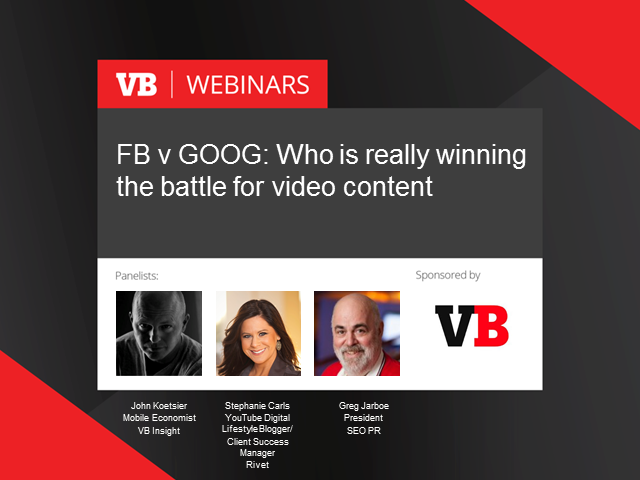 FB vs GOOG: Who is really winning the battle for video content? Every single day, the world's internet users spend well over 150,000 aggregated years reading, watching, clicking, liking, and commenting on digital content on the two global superpowers of digital content's sites: Facebook, and Google's YouTube. And every single day, more and more of the world's $600 billion advertising spend moves from TV and other legacy media to digital. One of the hottest battlegrounds is digital video. Mobile video advertising has jumped 5X in past months, and video offers the clearest path for TV's $172.5 billion in ad spend to go digital. Facebook's been staking a claim here, and media outlets have been proclaiming Google's demise. We'll dig into the findings of John Koetsier's latest VB Insight report and investigate actionable strategies for today's video marketer. We're also going to talk to hot video-based marketing leaders about what works for them in their own video content -- and their biggest tips for avoiding pitfalls and costly mistakes. * Monetize your content the right way... once and for all. Register today for this interactive marketing executive roundtable. You don't want to miss this one! This webinar is based on John Koetsier's October 2015 report. Title: FB vs GOOG: Who is really winning the battle for video content?